College students are notoriously adventurous and University of Cincinnati students are not immune to the exploratory spirit. In the Archives and Rare Books Library, we are in the unique situation to learn about and discover student adventures that may have otherwise been forgotten. An example is the story of Mary Louise Eich and her friend and Delta Zeta sorority sister, Mary Nichols. Last week, we received a donation of a book entitled, An Odyssey in the Life of Mary Louise Eichwritten by William Neal, the son of Mary Louise Eich. The book tells the story of Mary Louise’s life and the trip she made with Nichols in the summer of 1936 to Nazi Germany. Both Eich and Nichols spent a month working in Women’s Labor Service camps. 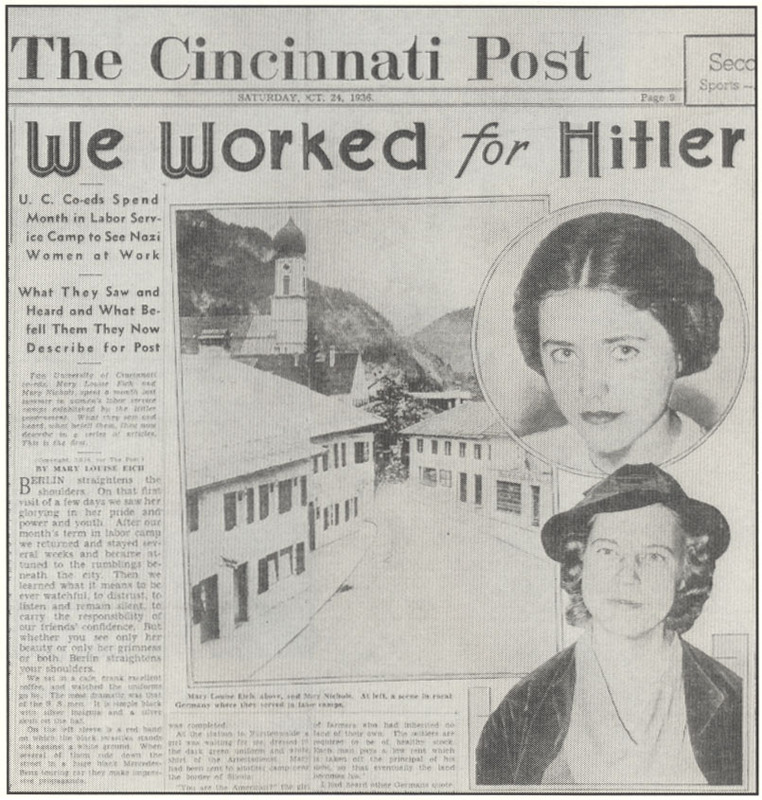 Upon their return they both wrote articles for the Cincinnati Post about their experiences. Neal’s book provides transcriptions of the articles Eich and Nichols wrote for the Cincinnati Post and is a great addition to our library’s holdings on German-Americana and University of Cincinnati history. Neal’s book provides few clues as to how Eich and Nichols were able to work in the Women’s Labor Service or Frauenarbeitsdienst. 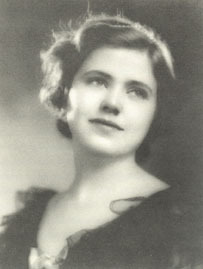 Nichols does write in her November 4, 1936 article, though, that Eich received permission through the Institute of International Education and asked Nichols to accompany her. By working in the Women’s Labor Service, Eich and Nichols could get an inside look into the lives of German people. During the 1930s, Women’s Labor Camps were located outside urban areas and the women learned both domestic and agricultural skills. The purpose of the camps included occupying the unemployed, providing community benefit from work, promoting the idea of a simple life, and educating young women. Originally completely voluntary, in March of 1934, six months of service became compulsory for young German women before they could attend college. [i] Nichols writes of her experience, “My four weeks stay here is both an adventure and an interest in the German slogan, ‘Kraft durch Freude’ (strength through joy). As an American girl I would learn the purpose of work in a German lager.” (November 4, 1936). Eich and Nichols were separated and sent to different camps. Although this must have been difficult on them, it resulted in unique experiences for both young women. Eich was first sent to Camp Molkenberg (Molkenberg, Germany). She found the young women there incredibly political and Eich offended them by refusing to salute the Nazi flag. She writes in her October 27th article, “I was getting pretty tired of politics in camp. The songs we sang, the books we read, everything was political. In the little free time we had the girls talked seriously with me of politics.” Eich was soon transferred to Königswalde in Neumark, where she had a more pleasant experience. The camp leader was very informal, her cohorts were interested in learning American folk songs, and villagers asked about American politics. Mary Nichols was placed in Camp Sablath at Christianstadt. She, unlike Eich, did not have a firm grasp of the German language and struggled to communicate. Nichols describes the difficult work endured at the camps and on the surrounding farms, a long bicycle trip to Sagan, and the variety of women she was able to meet in the camps including a women of both French and German descent from Geneva. In the Fall of 1936, Mary Louise returned to school at UC for her senior year. In 1938, she married William Leonard Neal with whom she had seven children. She died in March of 1954 from tuberculosis. Little is known of the life of Mary Nichols after her return from Germany, but maybe one of our readers can provide us some clues. We do know she graduated from the University of Cincinnati in June of 1936 with a Bachelor’s degree in Household Administration. An Odyssey in the Life of Mary Louise Eich provides a unique first-hand look at Nazi Germany and supplements other items in the Archives and Rare Books Library from American visitors to Germany during the 1930s and 1940s including the Carl Helmecke papers and the George E. Armstrong photograph collection. An Odyssey is currently being cataloged, but will be available in the Archives and Rare Books Library soon. [i] Stephenson, Jill, “Women’s Labor Service in Nazi Germany,” Central European History, 15.3 (1982): 245-246.